Palette Restaurant & Bar @ Capitol Piazza | JACQSOWHAT: Food. Travel. Lifestyle. Palette Restaurant & Bar, a revolutionary multi-brand dining concept by BreadTalk Group that brings together a specially-curated list of ten specialty food brands who are well-regarded for their expertise in different Asian cuisines. With over 400 items, we will all be able to experience a myriad flavours. Displaying a higher end food court serving up refined local food, we can all expect a higher price tag. Despite the steeper cost, Palette is a great place to play hosts to your foreign friends who wants to try some of the best local delights with elevated ambience, service, food and beverage offerings. 90 Gastro Bar presents a collection of Capitol cocktail tributes and sweet nosh that fuse familiar Asian flavours with classic Western desserts (desserts will be mentioned at the end of the post). On top of their extensive range of beers, wines and liquor, cocktails are designed to trigger a wave of nostalgia among Singaporeans. With that, here's Musical Express $17 by 90 Gastro Bar, a combination of pandan and banana-infused rum, boiled pandan syrup, banana liqueur and milk. Overall interesting but it didn't quite gel together as a whole. Each of the cocktail tributes bears a moniker that links back to the history of Capitol. For example, te number of seats in Capitol Theatre is represented in 1686 $17, a subtly floral nectar of grapes and raspberry-infused gin, elderflower liqueur, lavender and lychee syrups. Go for this if you fancy something refreshing and fruity! While Cabaret Oasis $17, a sparkling concoction of brandy, pink guava juice and soda, is a nod to the cabaret screenings previously showed at Capitol. I quite like this, being refreshing because of the soda. Despite the higher tag of these cocktails, I have to say the alcohol portion in it is generally much more. After much of such alcoholic drinks, we decided to go for other beverages such as Bandung $3. And wow I was blown away by it as it's slightly different from the usual bandung drink we had at coffee shops. Try it! The signature Huat Huat BBQ Chicken Wings ($12 for half a dozen/ $21 for one dozen) are USA and Europe-imported fowl which are prepped with a special marinade spiked with Chinese rise wine to give the meat added fragrance and a zest of sweetness. It is then paired with a proprietary chilli sauce. Next here is from the stall of IndoChili, an Indo-Peranakan family business with a repertoire of over 20 successful eateries in Jakarta and Singapore under their belt. The signature Sate Ayam Madura ($8.80 for 5pcs), skewers of toothsome grilled chicken garnished with fried shallots, a drizzle of kecap manis (indo sweet sauce) and served alongside homemade sauce of peanut jam and crushed peanuts. Fried Fish Cake $4.90 - From the stall of Ah Koong Restaurant, a Johor Bahru-based establishment is most lauded for its preservative-free fishballs and crisp-skinned fried fishcake, all handmade from ikan parang. Another is Ah Koong's dish, Fishball Noodle (Dry) $7.90. Every bowl comes laden with its signature fishballs and sliced fishcake, minced pork, fried shallots and noodles slicked with a viscous, umami black sauce or house-made chilli sauce if you prefer. You can pick from five types of Malaysian-imported noodles! However, I'm not a fan of noodles in black sauce, pretty subjective for this dish. From the stall of Yong Xin, which has 10 outlets across the island is a testament to their famous Fried Hokkien Prawn Mee $6. For a touch of luxury, we opted for the Fried Hokkien Crayfish Mee $15, which flaunts a whole steamed crustacean. Though not the best hokkien mee I had, it's still above the average belt. Ah Yat Seafood Kitchen, a well-recognised Hong Kong brand boasting restaurants in 7 different countries, including 3 in Singapore. Abalone has always been the headline act at Ah Yat - zoom in on their signature dishes like Ah Yat Noodles with Abalone $18. It is also prepared with Ah Yat's proprietary abalone sauce, a top-secret recipe that was created over 40 years ago. From the folks of Balestier Bak Kut Teh, offering hearty bowls of bak kut the, braised pig trotter and innards. For something comforting and familiar locally, be sure to order the Pork Ribs Soup (Premium) $9.50. The meaty pork bones are simmered for hours in a robust broth until tender and flavourful, while accompanied with a cloudy soup which is balanced with herbs, spices and pepper. From Hok Kee, their specialties have been winning over legions of fans, and has been touted as one of the 'Ten Best Delicacies in Yuen Long' since 2000. 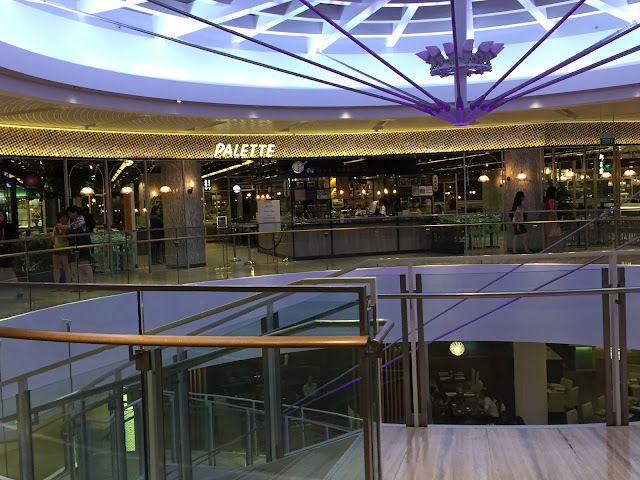 Their opening at Palette marks their first foray outside of Hong Kong, where they have 11 eateries; they run another two in Macau. Signature Braised Beef Brisket Noodles $9 - The thick gravy is brewed from a mixture of 10 spices while the beef brisket is braised for 2.5 hours in it. I love how soft and tender the beef is. Another popular item by Hok Kee is the Hong Kong-style Wonton Noodles $8, the highlights are the bite-sized parcels of shrimp, lean pork, pork fat and 'secret ingredient' - flatfish. Little Nanyang is first introduced in Food Republic Hong Kong in March 2013 as a purveyor of Southeast Asian Cuisine, serving items like Nyonya Pork Laksa and Nanyang Curry Chicken in Golden Pillow. Little Nanyang is now making its local debut at Palette with dishes like the Hainanese Chicken Rice Set $10.90. The chicken is steamed to moist and served with a mound of chicken fat-infused rice, kailan in oyster sauce, soup and quintessential trio of chili sauce, ground ginger and black sweet sauce. From the same folks of Little Nanyang, the selection of Chinese zi char dishes with favourites such as Champagne Pork Ribs $12.80. Succulent pork rib meat coated in a sticky, sweet-savoury champagne sauce. One of my favorite dish for the night, Tahu Telor $9.80 from the folks of IndoChili. They are blocks of deep-fried tofu blanketed in crispy fried egg. Not the most photogenic dish but this is so damn good. Staying true to the rustic flavours and cooking methods of North-West Indian cuisine, Delhi 6's alluringly-spiced dishes will transport you right to its titular city. Here's Chandi Murg Tikka $13, chunks of boneless chicken ensconced in a garlic and cashew nut cream sauce. There are vegetarians options as well, such as the Paneer Ke Sholey Roll $11.90. Finally to desserts after a long list of mains at Palette, Sunset Gula Melaka Banana Parfait & Butterscotch by 90 Gastro Bar $8. The new invention include layers of mascarpone and crushed Oreos topped with fresh banana slices and glazed with butterscotch sauce. Interesting mix with the nation's most popular local flavours. While some old-school desserts are given an unexpected twist, like the Golden Chilled Mango Soup with Sago & Citrus Fruits $8. A blend of mango ice cream, mango puree and coconut milk with a markedly airier, frothier texture than the traditional version. With a casual-chic Euro-Peranakan interior, the spacious Palette dining hall can seat up to 420 guests. Local and tourist can get a taste of Malaysia and Hong Kong with exciting newcomers, who have set up shop exclusively at Palette in Singapore. At the same time, familiar comfort food and perennial favourites are popular homegrown heroes such as Balestier Bak Kut Teh, Huat Huat BBQ etc. At Palette, you can expect a full spectrum of local delights. // To order at Palette, simply order at the stall counter and it will be served to you.